The happiest moment in this couple’s life turned out sorrowful as their wedding was interrupted by the man’s former wife. The incident happened in Zimbabwe. 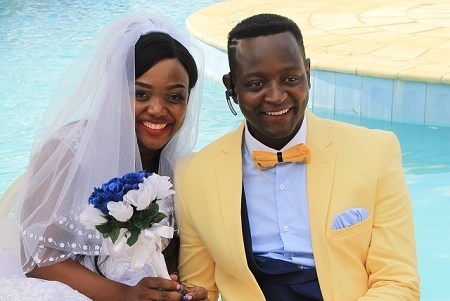 According to The Herald ZW, there was drama at popular musician, Sulumani Chimbetu and Linda Loveness Samuriwo’s wedding at Zimbali Gardens at the weekend when the musician’s ex-wife Marigold Mutemasango caused a stir with her close relatives at the entrance of the venue. However, she was denied entry as she wanted to stop the wedding claiming her marriage with Sulu still stands. She had an altercation with Chimbetu’s lawyer Kudakwashe Muteve at the entrance as she wanted to force her way through. It was gathered that the woman had caused serious commotion at Chimbetu’s residence in the morning before proceeding to the wedding venue. She argued and raised alarm at the wedding venue insisting that she is still married to Sulu although the two parted ways eight years ago. The incident forced the wedding to start almost three hours later than scheduled. According to the invitation cards, the wedding which was scheduled to start at 11am only started after 2:30pm as the groom and his family went into a long closed-door meeting upon arrival at the venue. Music icon Oliver Mtukudzi and his wife Daisy left around 1pm long before food was served around 6pm, even though guests had arrived at 11am. Christ Embassy pastor Ruth Musarurwa solemnised the holy matrimony and apologised for the late start. Sulu’s brother Collin — who spoke on behalf of the musician’s father — said that he was happy the Lord blessed the wedding. “I am happy for my brother and I want my sister-in-law to come and join me in dancing. Congratulations, you have done well for the family,” he said. Musician Jah Prayzah was best man while his wife Rufaro was the best lady. Some of the celebrities, socialites and musicians who attended the wedding include Ruvheneko Parirenyatwa, Hope Masike, Prophet Mwale, Munya Viyali and Chegutu West Member of Parliament Dexter Nduna.